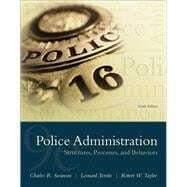 by Swanson, Charles R.; Territo, Leonard J.; Taylor, Robert E.
For courses in police organization, management, and administration. Built on the foundation of its authors’ decades of experience in law enforcement, training, and teaching, and updated to reflect recent subjects and concerns in the field of police work, this Ninth Edition of Police Administration: Structures, Processes, and Behavior blends a comprehensive introduction to police administration with key supporting details. Content is comprehensively illustrated with relevant, never-before-seen photographs, original tables and diagrams, cases studies, and “Current Event” boxes that provide thorough explanations of recent events. In this updated edition, the authors explore the evolution of American policing and modern organizational issues. This best-selling text vividly and effectively introduces students to the procedures, politics, and human relations issues that police supervisors and administrators must understand in order to succeed. Charles "Mike" Swanson joined the Marine Corps when he was 17 and later served as a patrol officer and detective with the Tampa Police Department. He worked in Governor Kirk’s Office as Deputy Director of the Florida Council on Law Enforcement and Criminal Justice. With more than 35 years experience, Mike has designed 11 promotional systems for state patrol, police, and fire agencies. He is experienced in conducting job analysis studies, writing written promotional tests, developing exercises and training assessors, and administering promotional assessment centers. He has trained assessors from 26 states. After leaving the Governor’s Office, Mike taught at East Carolina University before joining the faculty of the Institute of Government at the University of Georgia, where he was responsible for providing research, technical assistance, and training to Georgia state and local law enforcement agencies. Mike developed and led training for more than 10,000 law enforcement officers from 44 states and four foreign countries and also taught abroad. He retired as the Institute's Interim Director. Mike has co-authored several books, including The Police Personnel Selection process (1977), Introduction to Criminal Justice (1979), Court Administration: Issues and Responses (1987), Police Administration (9th edition, 2016) and Criminal Investigation (11th edition in progress). Three Governors have recognized Mike’s contributions to law enforcement agencies in their states. The Georgia Association of Chiefs has twice recognized him for contributions to the association, making him their first honorary Chief of Police for his continuing support. The University of Georgia twice granted him Distinguished Service Awards, as well as the Walter Bernard Hill Award for Distinguished Achievement in Public Service.